Though we have the most liberal governor in the nation, the PA House Republican majority has still produced several remarkable accomplishments for the people of Pennsylvania in the 2017-18 legislative session. -	Eliminating a more than $2 billion deficit WITHOUT raising income or sales taxes. -	Investing in the state’s Rainy Day Fund for the first time in a decade. -	Restructuring the public pension system. -	Authorizing wine and beer sales in grocery and convenience stores. -	Reforming the Unemployment Compensation system. -	Enacting a permanent and predictable Basic Education Funding formula. -	Protecting our best teachers. PA House Republicans are sensitive to the Pennsylvania taxpayer – whether an individual or employer. 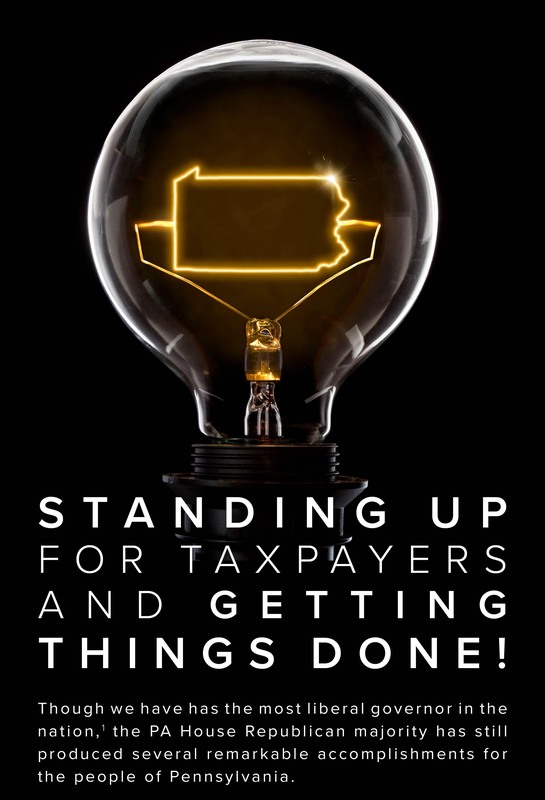 -	Legislative Republicans successfully defeated each of Governor Wolf's massive tax-and-spend budget proposals since 2015. For example, his 2015 budget proposal would have raised more than $12.5 billion in personal and business taxes, costing a family of four an additional $2,500 each year. -	While some politicians believed taxes were the only way, Republicans found a better way – without raising sales or income taxes. We have done this with responsible fiscal policies and controlled spending.